A Fijian Site Support Group (SSG), comprising representatives of local families, is teaching the next generation the importance of conservation. Using games, comic strips and colourful pocket guides, they are raising awareness amongst school children about biodiversity, forest ecosystems and the importance of using resources sustainably. Mount Nabukelevu Important Bird Area (IBA) is the highest mountain on the Fijian island of Kadavu, with the largest area of montane forest in west Kadavu. The lower slopes have been largely cleared for agriculture, but the top of the mountain remains untouched because of its rugged terrain and high rainfall. It holds all four Kadavuan endemics (Kadavu Fantail Rhipidura personata, Kadavu Honeyeater Xanthotis provocator, Crimson Shining-parrot Prosopeia splendens and Whistling Dove Ptilinopus layardi) and may support nesting colonies of Collared Petrel Pterodroma brevipes—however the exact status of this threatened seabird is currently unknown. Unsustainable practices were causing degradation of agricultural areas, leading to further pressure to clear more forest. BirdLife worked with the local communities to identify problems, define potential solutions and develop appropriate skills. This led to the establishment of a Site Support Group (SSG), comprising representatives of land-owning mataqalis (family units), who wanted to manage their forest resources sustainably. The Mount Nabukelevu SSG decided to involve young people, and particularly school children, in their conservation efforts. 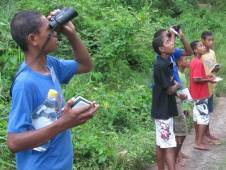 Educational tools aimed at the children of Kadavu include a cheap but robust and child-friendly pocket guide to Kadavu’s birds, and a comic strip giving information about the value of forests, ecosystems, birds and biodiversity in an easily understandable form. Both are published in the local language. The comic describes practical alternatives to the practices currently degrading Kadavu’s forests, including the importance of sustainable management for soil conservation, food security, water quality, climate change, biodiversity and non-timber forest products. The guide and the comic have been distributed to all the primary schools in Kadavu. Eco-camps were held during the term breaks, complete with games, bird identification training, quizzes and nature walks for the children of the three primary schools in the Mount Nabukelevu area. Nature clubs and school-based nature programmes have been set up at each of the schools, and the children are involved in a tree-planting programme focusing on the degraded areas of the forest. These activities will be rolled out to other schools on the island if further funding can be obtained.